Interior detailing on the sides and what heap shield / end panels do you want? There is a possibility of having and injection moulded plastic kit for both the standard and alternate standard versions of the offset 2 bay coal car. This will be a flat kit with, sides, chassis frame, ' W ' section and ends all separate as per the Revel, etc aircraft kits. Detailing parts will be done in etched brass. At this stage there are several options ;- 1/ How important are the interior details - running cars loaded ( for weight ) you won't see the interior ribs. 2/ choice of ends/heap shields - flat / curved / angled / notched curved / notched angled. Personally, I would prefer a ribbed side hopper, which I would think might be easier & cheaper to make the mold, since the inside could be made flat. With an offset side car, the backside would have to have molded relief to match the offset on the outside. Of course, even the offset sides could be made with flat backsides if the cars had loads, but without loads, they wouldn't look right. Perhaps the molds could be shared to produce the three basic styles of cars, offset, ribbed, and composite sides. Having the different types of ends would be a plus as well. Many cars had the end extensions added after they were built, so some styles of those could be glue-on parts that fit on the top of a flat end. One of the biggest challenges would be affordable trucks and wheelsets, a choice of Andrews or Bettendorf would be really welcome. Trouble is I don't have much info on the rib sided cars. My understanding is that the 55 ton cars were 30' not 33' long. I am looking at trucks as well but, the tooling for that has to a be a multi-action die with sliding cores and will probably cost more than doing the coal cars. One option could be along the lines of the old Gold Coast, now Lok-N-Roll truck or as some HOn3 trucks are with just sideframes that fit a metal centre bolster. Just a question: why have you decided to make something what already exists in TT scale in a reasonable quality? I see that you could use all the decal sets which were made for the Kemtron model, otherwise I do not see any good reason for making again something we already have. The market for your car would be very limited because many people have those models already. Could you think of a rib side hopper or war emergency composite hopper instead (if it has to be a 2 bay hopper) - or if you like the offset side hopper, then make it a 3 bay please! Maybe I would buy a couple to support you but I would buy a dozen if you make a hopper we do not have yet. Does that make a difference? Regarding the info on the cars: if you need more info, just ask here. It's really quite simple. I've planned on doing the models I want/need and the Nth Pacific have a small group of 200 of the offset 2 bay cars series 70200. The alternate side and ends are for the B&O / C&O modellers. The drawings are 3/4 finished BUT if there is an rib sided or composite sided car that uses the same frame / length then it could be added to the equation. I have a small batch of 3 bay hoppers from Shapeways ( Bone Valley ). Not the greatest but close enough for the CB&Q cars for me. The first loco will be the CF-7, angled cab version only, done along the same lines as the GP38-2. I understand that. But wouldn't it be easier to buy the 2bay offset hoppers instead and focus on something else? Up to you. I think that the old model was good enough. Of course, you can make it better (and slightly longer) than Kemtron 50 years ago. The riveting is different on NP car. 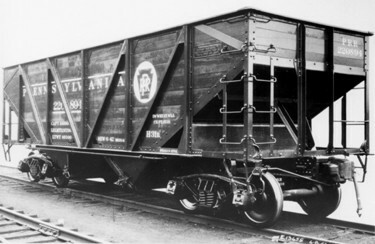 Some of the war emergency hoppers were also around 33'. Pennsy class H31B. (1941 class H31 and post war class H31C too). Length over strikers 32' 9"
The "generic hoppers" from Bone Valley on Shapeways is a different story. He made some very nice hoppers for his quartz sand operation in Florida. But the "generic hoppers" are not good. (Or does anyone know about a prototype suitable for those? I could not find any.) Just spending half an hour more on the design would help. Better one car correct than 4 models of nothing. Alright, I'll throw this open to the forum. If you can provide details / plans /specific dimensional drawings for a rib sided and or composite version of these cars, that will use the same frame / chassis set up I will look at getting the extra cavities cut into the tooling. It must be the same 33' inside car length. Better yet Ian, you could provide the name of your toolmaker to anyone that criticizes what your making, that way they could just have their own cars made? It would be a Win- Win, we'd get two or three versions of new hoppers! And the ones that like to complain can find out just what it actually takes to make something vs. just buying it?.